In the context of rising health care costs and growing emphasis on budgetary containment and evidence based decision-making, there is an increased interest in health promotion and prevention initiatives. Prevention is thought in many instances to be cost-effective; investing in prevention now will avoid having to pay for more costly acute interventions. Good health and improved quality in itself may generate economic growth, with people having more opportunities in life to maximize their educational, labour, and social potentials. 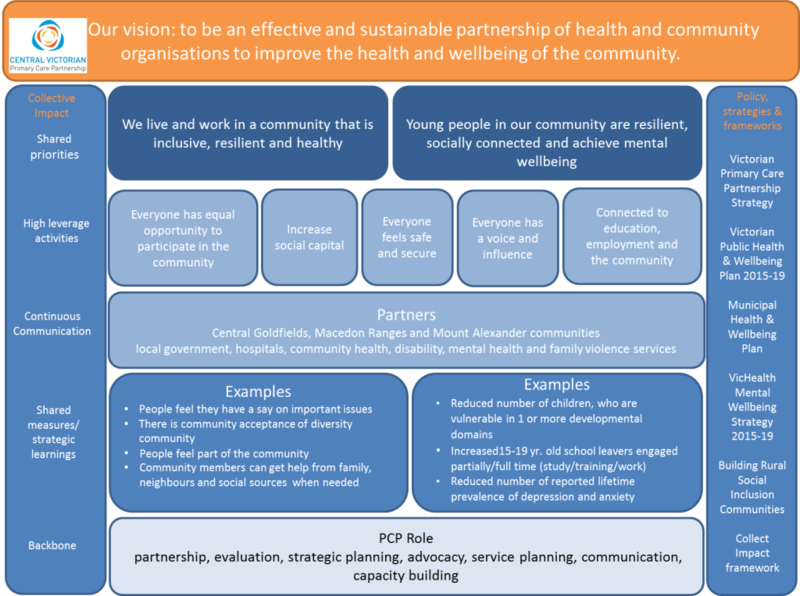 It is agreed to focus the available resources of the CVPCP on prevention and to work together across the three shires to build socially inclusive and resilient communities to improve health and wellbeing. To build a socially inclusive community will require effectively engaging the community, building community capacity, ensuring equity of access to supports, mobilising social capital, embracing diversity and facilitating community empowerment. We know that for longer-term impact we must focus on the early years – children, young people and their families and we understand that we must work within a social model of health and wellbeing – otherwise we are supporting siloed approaches and band aid strategies. There is a wider environment of reform and change that we must be able to understand and respond to, so we can support our partners to identify and act on opportunities for collaboration and mutual benefit and to remain sustainable. The figure below summarises our priorities and approach to progressing the CVPCP strategic plan.